Play chess with Batman’s allies and villains who have made your childhood unforgettable. Batman is a hero that has long captured the public’s imagination. Ever since his parents were tragically murdered at random by thugs in a back alley, Bruce Wayne has made it his mission to protect the streets of his home, Gotham City, not through any innate superpowers like other superheroes, but rather by using his wit and wealth. Rather than the powers of flight, super strength, super speed, or invisibility, Batman defeats his enemies through intellect, good detective work, and by harnessing the cutting edge of technology and using it to his advantage. This makes him highly unique among the comic book crowd and has led a lot of fans to consider him their favorite superhero. If that sounds like you, you may be interested to learn that there are many Batman themed chess sets available for you to play on! Batman is famous for showing mercy to his enemies and never using guns or killing people, though you need not show so much restraint in your games of chess. Swoop in as the Caped Crusader and capture your opponent’s King, leaving him powerless to enact his plans of violence and chaos upon Gotham City! Neutralize the enemy’s pawns before they can commit any more acts of random violence like the one that claimed the lives of Bruce Wayne’s parents. And, most importantly, don’t forget to protect the ones you care about – your own pawns, bishop, rook, knight and Queen! This Batman themed chess set has all the bells and whistles. White’s (or, in this case, Yellow’s) pieces are modelled after such iconic Batman characters as Robin, Batgirl, Commissioner Gordon, and of course Batman himself. They also include pieces modelled after the Batmobile, the Bat signal, and the Wayne Enterprises Building. Purple’s side includes the Joker, Catwoman, the Riddler, the Joker’s van, the Joker’s Lair, and a time bomb. Each piece is made out of pewter and die cast metal, and all the pieces together weigh a total of 13 pounds! 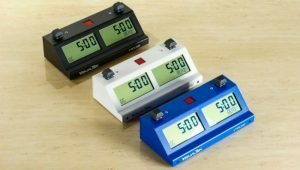 The pieces range in height from 2 ½ to 5 inches tall. The Batman Gotham Cityscape Chess Set comes with a black storage box in which all the pieces can be stored when not in use. The chessboard itself is really the star of the show here, though. It has an oversized 20 inch by 20 inch playing surface which is rimmed by 50 LED lights. These lights can be activated with a simple press of the Batman symbol on the side of the board. 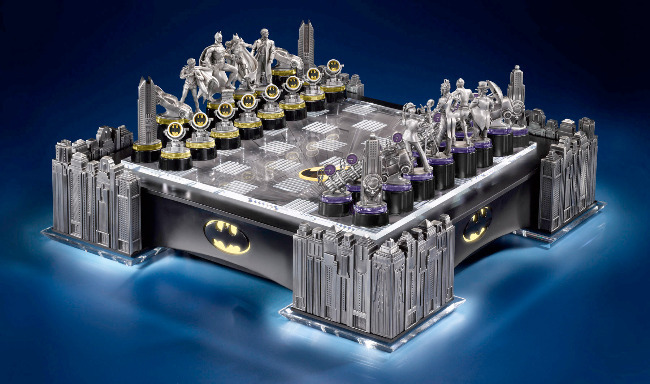 The Batman LED light-up chess board is powered by 4 D batteries, will provide hundreds of games worth of use. The corners of this chess board rest on 4 intricately detailed, metal replicas of Gotham City’s skyline, which are lit from below. The entire chess set together weighs more than 34 pounds! This complete batman chess set is a collector’s item that is built to last, and it will definitely stand up to years and years of play. 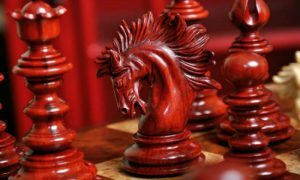 It is a spectacular set that sits right at the intersection of luxury chess sets and themed chess sets- this is truly a luxury, themed chess set. While this product may appeal to children who love to watch Batman in summer superhero movies, this is very much a high-end product for adults. But don’t worry, the longevity on this product is such that you’ll easily be able to pass it down to your kids when you’re done using it! The 32 piece Batman chess set is a best seller for good reason. While it’s more simple and less flashy than the other Batman chess set, it’s still a high quality product. 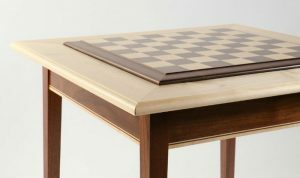 The 32 Piece Batman Chess Set opts for finely crafted, detailed pieces for its wow factor, rather than LED lighting and sheer size. Each of the 32 pieces included in this DC comics Batman chess set is individually hand painted in full color, down to the tiniest detail. What’s even more impressive is that each piece is completely unique- the pawns aren’t just identical copies of one another, they’re actually each totally different characters. With this many unique pieces on the board, chances are good that your favorite characters will be represented, even if they’re not usually considered to be main characters. Some of the characters on the board are Batman, the Joker, Robin, Harley Quinn, Batgirl, Poison Ivy, Alfred, and the Penguin – just to name a few. There are 24 more where that came from! 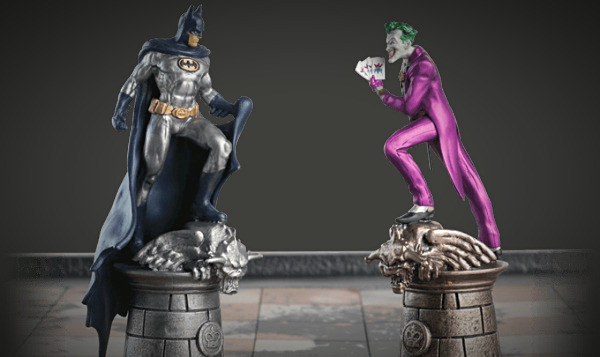 The White team (Batman’s side) has pieces finished with a silver sheen, while the Black team (Joker’s side) has pieces with a bronzed finish, though they can be hard to tell apart if you’re not familiar with the characters. We recommend only playing with this Eaglemoss Batman chess set when your opponent is as big of a Batman fan as you are, to minimize confusion. Of course, since each piece is a unique character, and their heights and personalities don’t really seem to be indicative of their rank, it’s almost impossible to tell which character is meant to function as which piece without memorizing the list, so this may be best as a display set rather than a functional chess set to play with. 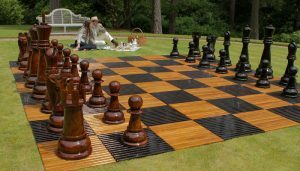 The chess board is emblazoned with a large bat symbol in the middle of the board and the outside perimeter is designed to look like bricks to give it a Gotham City vibe. 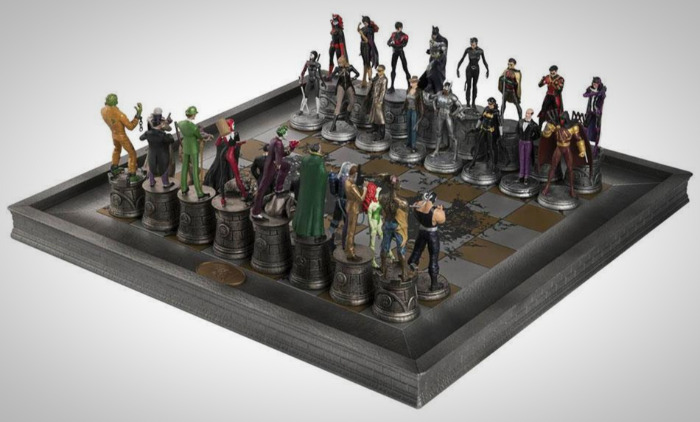 If you’re a fan of Bruce Wayne, the Dark Knight, the Caped Crusader, and Gotham’s greatest protector, the Batman – you simply need one of these DC comics complete chess sets. The quality is unbeatable, and you’ll be able to wile away countless hours fighting against Gotham’s vilest villains. A Batman themed chess sets turn every chess match into a battle against good and evil in the city of Gotham. If you’re a fan of Batman, you simply need one of these chess sets! Any of these themed Batman chess set Collections would look great in your home, office, or bat cave. They make great gifts for the Batman loving chess player in your life, or as a generous gift to yourself! The high quality craftsmanship in each of these Batman chess sets means that they will likely only appreciate in value, making them a good investment not only financially but also in the enjoyment you’ll be able to get out of them for years to come. These are the best Batman themed chess sets available in 2019. 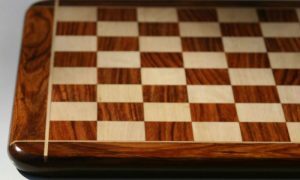 If you’re in the market for such a chess set, these are our top recommendations. We’ve also done reviews of chess sets with other themes. 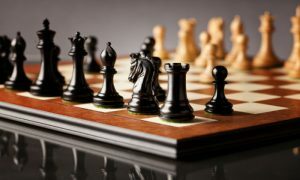 If Batman isn’t your thing, or you just want another themed chess set to keep this one company, check out our lists of Dragon chess sets, Mario chess sets, Isle of Lewis chess sets, Civil War chess sets, and others. 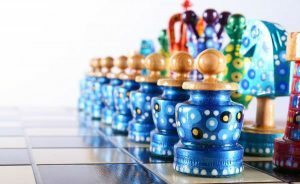 Or see our full list of themed chess sets on our main themed chess sets page! No matter what type of theme you’re looking for, there’s a chess set out there for you, and we’re going to review it.